Today I’d like to tell you about another favorite sandwich of mine from Lenny’s. You may remember them from the time I wrote about the #10TC, or when I wrote about the time I took pictures of my Cape Cod potato chips. Well here you go, one more sandwich for your list. 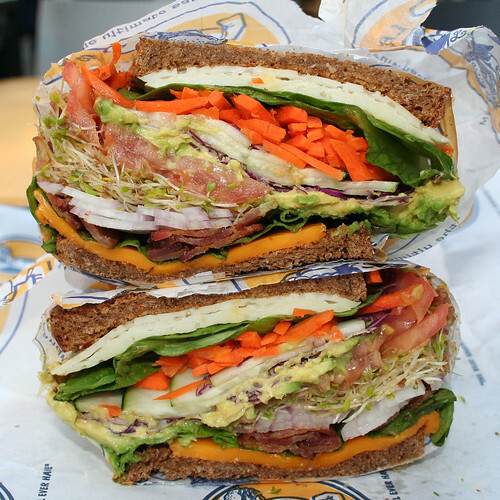 The #4 Diet Style with avocado and bacon. The second time I went to Lenny’s I found my favorite sandwich. I was feeling diety at the moment and it was a hot summer day, so I ordered the sandwich with the most amount of cool and refreshing veggies possible. But I was hungry. And since I’ve counted calories from time to time, I know how very few calories are actually present in a pile of veggies. So I added a little avocado to the order. I reasoned, that avocado is a healthy fat and is full of flavor, thus the perfect addition. And the bacon? Why for the texture and flavor of course. Sandwich description: Alpine swiss and alpine cheddar cheese with romaine lettuce, tomato, onion, carrot, cucumber, shredded red cabbage and alfalfa sprout on 7-grain whole wheat. I like this sandwich so well, that I order it three out of every four times I go to Lenny’s. It’s that good. So there you have it, the #4 Diet Style with avocado and bacon. It comes highly recommended, with two thumbs up. You want to know what I got the first time I went to Lenny’s? Why a BLT on toasted white bread with mayo. Because let’s face it, if you’re going to have a BLT, a little white bread isn’t going to hurt you, and the mayo? Why, that’s one of the best parts. The next time I happen to order this beauty, I’ll snap a photo and post it for all of you to oogle. Oohh that looks yummy, except if those are carrots. I'd have to pull those out. I don't know what it is, but everytime I get done with a workout and then checked your blog, there is another pic of a delicious food item staring me in the face! AAAAUGH!! That's okay, though. I still enjoyed my linguine pescatore. Columbia: Oh poor Lenny's. I wonder if they'll ever get over being punished because of the lousy agent. Or was that lousey? Perhaps you need to start carrying some bug spray around with you. Patrick: You don't like Carrots?!? I don't know if we can be friends anymore...well, maybe we can since I think you're funny. Uncadan8: Well that's what I'm here for. Blogging about food to make you salivate over, knowing full well that you're a couple hundred miles away and have no opportunity to quench said salivating. On a side note, linguine, Mmmmmmm, hope your ride was nice.